ChaleOnline.com was developed in August of 2004. My name is Jaime G. and I wanted to make a website that I can go to and get all of my favorite stuff all in one place. So in essence it was a personal site in the beginning. Although I still consider it be and represent what I like still. Family and friends have helped me with maintaining and updating it. Not to mention added their flavor to Chale. It’s been around 3 years since we started this site and as you can see it’s grown to what you see and hear today. With the help of our visitors, artists, and affiliates Chale Online has even more room to grow. 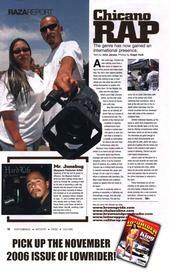 As many of you know Chale was featured on Lowrider magazine’s Raza Report. Chale Online now has Exclusive interviews with chicano rap artists, singers, and any chicano trying to come up in this crazy world we call Earth. We also expanded our site with more informative news like events, music videos, and actual articles. This site will only grow if you send us your ideas, artists help, and I maintain some level of control and time to update the site. I really did’nt like english class in high school and now I wish I could have done better so I can actaully write something properly. Chale is now my english, video, and music class. Help support chale by clicking on advertisments and supporting artists we have on here. You can find banners etc here. Let’s stay positive and do our thing gente. Alright then!